VirtuFon Networks is a provider of Virtual Phone numbers. VirtuFon's WorldFon service allows you to own a local phone number in one of 34 countries. We forward your VirtuFon number to any phone in the continental U.S. or Canada, or to Skype, or to a standard VoIP phone. 1. A caller in Bulgaria, for example, calls your VirtuFon Bulgarian phone number, and pays only for a local call. 2. 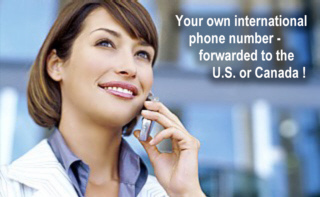 VirtuFon forwards the call to your Home, Office, or Cellular phone in the continental U.S. or Canada!